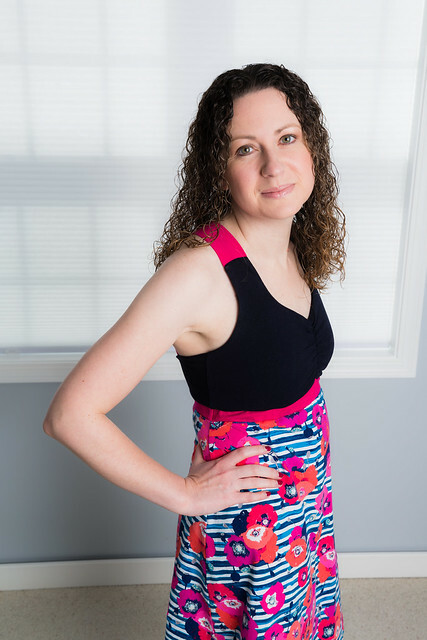 When I saw on Facebook that 5 out of 4 Patterns was asking for participants for their Summer’s Coming blog tour (be sure to keep reading for a discount code and giveaway), I thought it would be the perfect push to finally make the Journey Dress. I even already had this cotton lycra fabric, that I bought at least three years ago, just for this dress. Fabric hoarding much? Or maybe just a slacker? The reason I was dragging my feet was because I was afraid of it not fitting. Well, there was really no need to worry, because the pattern has many tips and tricks on how to get the perfect fit. It even includes different cut lines depending on your sewing cup size (instructions on how to determine your sewing cup size are included). As well as many pictures and explanations on how to get the bra portion to fit properly. I actually used some smaller scrap pieces of cotton lycra to make a sports bra first to make sure that it fit properly. The only actual adjustment I had to make was to shorten the straps. But I think that is probably because they are drafted a little long because of all of the options on how to make them. Speaking of options, let’s talk a little more about all of the them for this pattern. You can choose between a sports bra, tank top, short dress, or maxi dress, as well as a maternity version of each. For the straps, you can choose between straight back, cross back, halter top, or twist back. 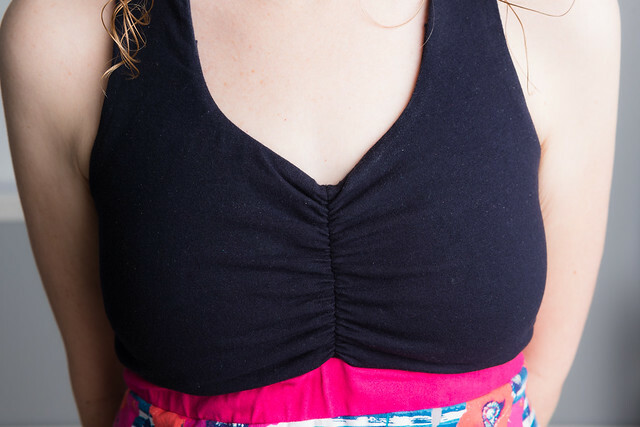 You can also include sewn in, removable, or no bra cups, as well as a nursing option. I chose the short dress option with a cross back and removable bra cups. I was thinking about making the maxi length, but I didn’t have enough fabric. Not to mention, maxi length doesn’t always look the best on me because I’m so short (5’2″ on a good day!). I think I mentioned that I used all cotton lycra fabric. The stripe fabric is a little lighter weight than the solids, so it lays nicely for the skirt part. For the bodice, I actually have three layers of fabric since I chose to do removable bra cups. I should have used power mesh in the straps (pink pieces) for a little more support since I wasn’t using a heavier weight fabric for them. I only say that because I just have two layers in the sports bra version that I made and feel that it gives me better support. So I think the heaviness of the three layers of cotton lycra, plus the skirt, is a little much for the straps. It’s not terrible, but enough that I can tell there is a difference. I could probably just shorten the straps a little more. When trying to decide on sewn in bra cups or removable bra cups, I searched the 5 out of 4 Patterns facebook group to see what others thought. I found that many others feel that sewn in bra cups are much harder to get the perfect fit/placement. So I decided to just go for the removable bra cups. I already had some that were from my nursing bras from a few years ago so I didn’t need to buy any. I think I might have some from an older swimming suit as well. So search your dresser before buying new ones! It was pretty easy to do the removable bra cup “pocket”. There is a tutorial on 5 out of 4 patterns blog here. Essentially, you cut off the straps of one layer of the front bodice lining. I actually didn’t cut mine low enough, so it’s super difficult to get the bra cup in place since the opening is only about an inch and a half wide. The hardest part for me was keeping track of which pieces were my lining and which was my main fabric. That was because I used the same fabric for both, so I ended up sewing it together incorrectly and had to try again. Thank goodness for seam rippers! In the end, you have a full main piece, a full lining piece, and then one lining piece that doesn’t have the straps. With the two lining pieces, they form a “pocket” for the removable cup. Once you have the bra portion done, the rest is pretty simple. Before sewing on the skirt, you want to make sure it fits and that the straps are the correct length. I had to shorten the straps a lot in order to get it to fit properly, but that is easy. Then from there, you just sew the skirt together and then onto the bra portion. Insert elastic and you are done! This dress is perfect for summer! It’s comfortable, flowy, and the top stays in place. If you aren’t a dress person, you could make a tank or sports bra. You can customize it to your preference. I’m not a halter top person, but if you are, then make it a halter top. If you are creative, I’m sure you could come up with other ways to make the straps. Cotton Lycra is super easy to sew with, so if you are nervous about sewing with knits, try Cotton Lycra. I would definitely recommend the Journey Dress! It was fun to sew and turned out exactly as I had imagined. It has many options to make it just how you prefer, but not too many to where it’s confusing. Now, head on over to 5 out of 4 Patterns and look around. If you find something you like, don’t forget to use coupon code “summerscoming” for 30% off from May 7 – 11, 2018. I have a few of their other patterns that I need to try out. One being the Agility, which looks to make a super cute swimming suit top. Don’t forget that the pajama pants pattern is free and the Ninja Pants, Women’s Luna Skirt, and Girl’s Little Luna Skirt all have a special promotion with a code in the 5 out of 4 Facebook group. Do you want to win a 5 out of 4 Pattern of your choice? Enter below for a chance to win! Good luck! Also, be sure to check out the other blogs that are part of the tour this week. Lots of inspiration and possibly another chance to win a pattern! This post may contain affiliate links. Meaning, at no cost to you, I get a small percentage of the sale if you purchase after clicking. All proceeds will be used to help keep this site up and running and allow me to continue to create additional content. Thank you for your support! Love the ruching and the cup link too! Great job! Love it! Looks great on you. I don’t have the Journey so that should be my next sew. I really want to try the agility! This dress looks super nice too!! I have this pattern! I’m looking forward to sewing it as a swimming top. Thanks for your description of how you sewed it! My favorite pattern is the Nancy raglan. I’ve made like 5 tops & just finished my first dress from the pattern.